When the persimmons ripen in the fall, you may find you have an overabundance of the sweet fruit. Its slurry inside freezes well, but you can also freeze the fruit whole and unpeeled. You need only to thaw the fruit partially to use it in most recipes. 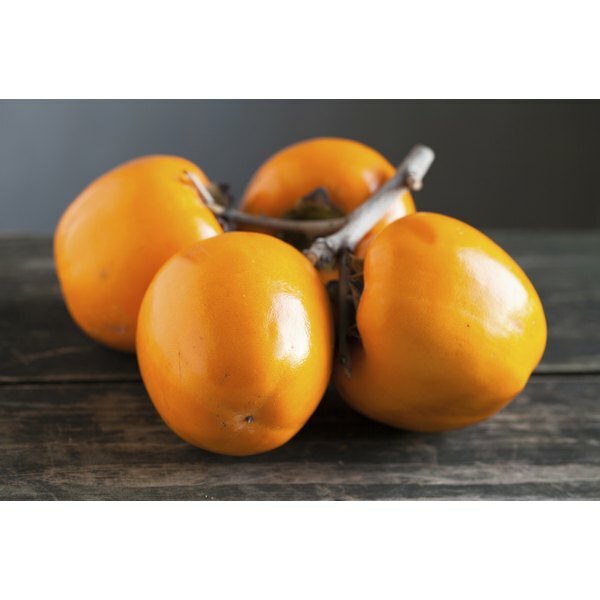 It works well in a variety of recipes; serve partially thawed persimmons over ice cream or yogurt or use them in salads, cakes, pancakes, cookies, pudding or mousse. Or use frozen persimmons to make jam or marmalade. Wash the outsides of the persimmons under cool running water and wipe them dry with paper towels. Place the persimmons in a freezer-safe, resealable storage bag. Seal the bag, making sure to squeeze out any of the excess air. Label the bag with the date and place it in the freezer. Wash the persimmons under cool running water and wipe them dry with paper towels. Peel the skin off the fruit with a paring knife or vegetable peeler. Scoop out the seeds with a spoon and cut the fruit into slices with a sharp knife. Puree the slices in a food processor or blender. Transfer the pureed persimmons to a freezer-safe bag. Add 2 tbsp. of lemon juice per pint to the bag. Place the pureed persimmons into the freezer. Combine the pureed pulp with cream cheese along with orange juice, honey and salt to make a dressing. For convenience, freeze the pulp in 1- or 2-cup batches.